This month I’ve got three things in my sewing queue and I thought I’d share them with you. 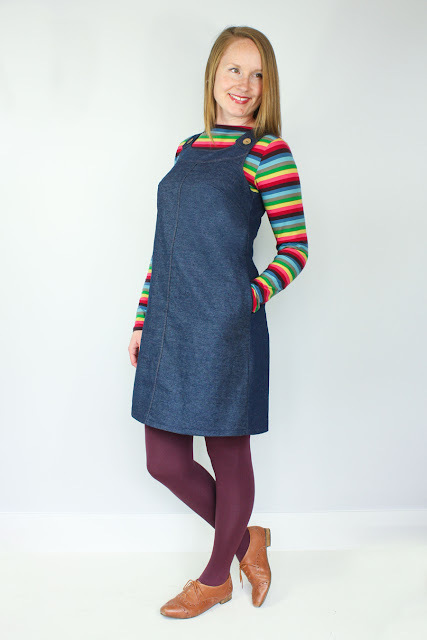 First up is the Jennifer Lauren Ivy Pinafore. I absolutely love this pattern! I’m a big fan of dungarees and pinnies but they often don’t suit me. The shape of this one really appealed to me and I bought the pattern a couple of weeks ago. The fabric I picked is a dark green cotton corduroy from Ainsberry Fabrics’ Ebay shop. I really dislike ordering fabric online but I needn’t have worried. It’s great quality and super soft! Next on my list is a Sew Over It Erin Skirt. I had originally planned to make this in corduroy too, but you can have too much of a good thing so I’m going with this navy floral stretch cotton instead. I’d like it to be quite fitted around my hips so I’m going to choose a size that doesn’t give me too much ease there- wish me luck! I haven’t yet decided on the length and I think I’ll end up cutting it somewhere between the two views so it sits just above my knee. I’ve been wanting to have a go at this pattern since I first clapped eyes on it so I’m really excited to get started! My last planned make for this month is another Great British Sewing Bee jersey top. My first one was pretty successful and I wear it a lot. I want try colour blocking so I can make use of two or three remnants. I have this lovely flecked sweater knit that was in a free bundle from Fabworks, and some deep grey jersey and blush pink georgette that were both 30p a metre! I’m not yet sure if I’m going to use all three, or just the sweater with one other. I’m not sure if it’ll even work because the fabrics are so different. I’ve got woven and knit, two way and 4 way stretch- there’s a lot that can go wrong but I’m going to cross my fingers and give it a try anyway. Although I like the fabrics, they were all super cheap or free so it’s no great loss if it doesn’t work out. I’ll report back with my makes as the month goes on. What are your sewing plans this month?